Kits for "Blå Dimman" - The Blue Mist are available. To order a kit and for more information please fill out the information form below. The Gray, Green and Blue Mist are originaly designad by Kerstin Olsson 1963-1965, the Blue Mist is recreated by Pernille Silfverberg 2016. 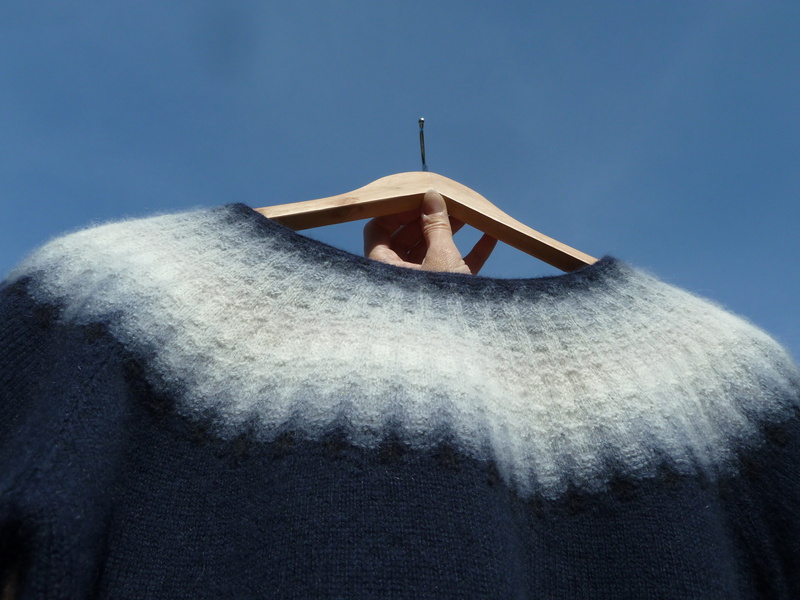 To recreate The Blue Mist original charts were closely studied and vintage garments carefully examined in museums and private collections to make sure that the resulting patterns and yarns would match the original Bohus Stickning garments as closely as possible. The yarn is a 2-ply, 50% angora och 50% merinoyarn. 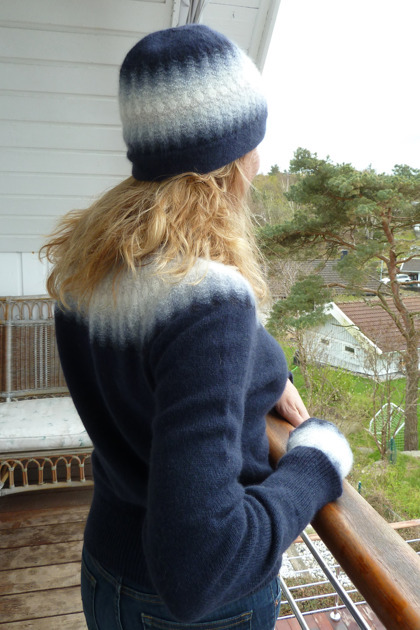 The pattern yarns are hand dyed by Pernille Silfverberg to match the original Bohus Stickning pattern colors. The main color, a dark blue, is dyed at the spinning mill. The angora comes from AngoraGarnet’s own angora rabbits. We guarantee that the rabbits are treated humanely and live healthy lives. We also guarantee that the merino wool used is produced without the controversial practise mulesing. The angorawool is processed and spun with merino wool at a family owned mill in Denmark. Pattern copyright: Bohus Stickning. Pernille Silfverberg, AngoraGarnet has been authorized to continue the work of recreating Bohus Stickning after original Bohus Stickning such as Solveig Gustafsson began to do in 1999. Read more about Bohus Stickning. See the Bohus Stickning recreated collection. Pattern available only with purchase of yarn kit. The description may not be copied or used to knit garments for sale, but only used for personal use. All pullover/cardigan kits contain sufficient yarn to knit the largest size XL. Instructions in English or Swedish are included for both pullover and cardigan sizes XXS to XL.